The Line Up for Sunday, August 19 – Readjusted on Saturday due to Weather — Saturday wrist bands will be accepted Sunday. Celebrating over 40 years since their founding in 1977, New Orleans-based Dirty Dozen Brass Band has taken the traditional foundation of brass band music and incorporated it into a blend of genres including Bebop Jazz, Funk and R&B/Soul. This unique sound, described by the band as a ‘musical gumbo,’ has allowed the Dirty Dozen to tour across 5 continents and more than 30 countries, record 12 studio albums and collaborate with a range of artists from Modest Mouse to Widespread Panic to Norah Jones. 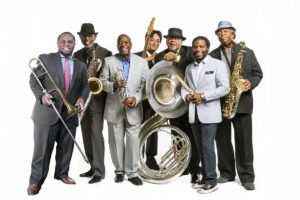 Forty-plus years later, the Dirty Dozen Brass Band is a world famous music machine whose name is synonymous with genre-bending romps and high-octane performances. 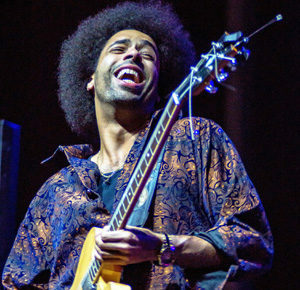 With his fiery guitar and lap steel playing, his trailblazing, instantly memorable songs and gritty, unvarnished vocals, Selwyn Birchwood is among the most extraordinary young stars in the blues. 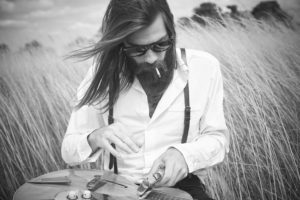 Birchwood’s meteoric rise from playing small Florida clubs to headlining international festival stages is nothing short of phenomenal, as he continues to set the contemporary blues world on fire. The album received the Blues Music Award and Living Blues Critics’ Award for Best Debut Album Of 2014, and he won the 2015 Blues Blast Rising Star Award. Selwyn and his band have crisscrossed the U.S. and Europe repeatedly, delivering unforgettable live performances. With his new album, Pick Your Poison, Birchwood, along with his band—saxophonist Regi Oliver, bassist Huff Wright and drummer Courtney “Big Love” Girlie—takes a major step forward, crafting visionary blues for a new generation of forward-looking fans. Following a string of successful shows opening for legendary artists, Lynyrd Skynyrd, Johnny Hallyday, Robben Ford, and Tony Joe White, Jack headlined his own whirlwind international tour, playing sold out shows for music lovers in Europe, New Zealand, Japan, the US and Canada. “Fifty years have passed in a flash,” says Texas-born, Louisiana-raised pianist, songwriter and vocalist Marcia Ball of her long and storied career. Ball, the 2018 Texas State Musician Of The Year, has won worldwide fame and countless fans for her ability to ignite a full-scale roadhouse rhythm and blues partyevery time she takes the stage. Chris Stovall Brown has been playing music since the age of six when his parents came home with a set of bongo drums, which he taught himself to play in a matter of days. At the age of eight, his elementary school offered him the opportunity to study drums and he grabbed it. Acquiring a drum a year for Christmas, Chris was soon playing with neighborhood bands and actually did his first gigging as a drummer at the tender age of 13. Playing in both jazz, rock and wedding bands helped him to gain a wealth of expertise in various styles of music. Picking up the harp at the age of 11, after a sax player left it at rehearsal, his attention was now diverted to two instruments and he started spending his allowance and gig money on blues records (an obsession that continues to this day). 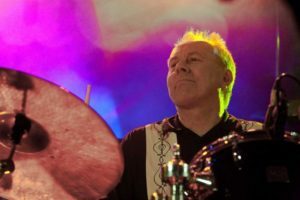 These days you can often find CSB playing international shows as the drummer for WATERMELON SLIM or playing regional shows with J.GEILS, JEFF PITCHELL, THE COLBY’S, JAMES MONTGOMERY, SWEET MELISSA, MADELEINE HALL and SHIRLEY LEWIS in addition to fronting his own STOVALL BROWN BAND!